Judd Trump believes his first televised ranking tournament victory will kick-start his career and be the platform for more titles. 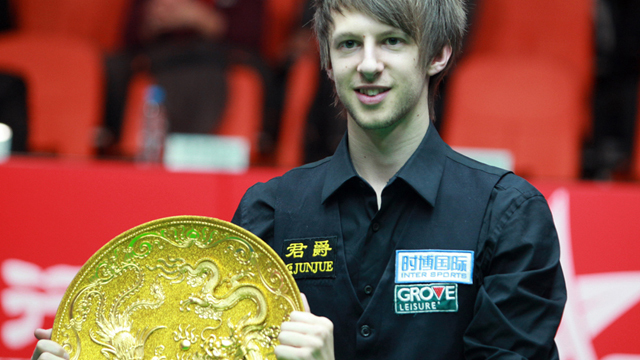 Bristol-based Trump, 21, defeated Mark Selby 10-8 in a thrilling final to clinch the Bank of Beijing 2011 World Snooker China Open at the Beijing Students University Stadium. “My career starts now,” said a delighted Judd. “The last four or five years have been a steep learning curve and just prepared me for this moment. “It’s an unbelievable feeling and it’s come out of nowhere as I’ve never shown any form this season. “Every time I got to a venue I was preparing myself to come home early, that’s the lack of confidence I had. “Against Marco Fu (in the first round) I doubted myself so much just wondering if I was any good and if I would win. But as I got through every match I felt better and better so hopefully I can go on to win a lot more tournaments. “When I first turned professional I thought I could do it (win a ranking event) within three or four years. “But in the first couple of matches in the first year on tour were just so tough. A few people will now take notice and realise I’m a good player and can do it. “It’s nice to be called a boy wonder by the press here but there are a lot of players that have done a lot more before my age including Ding Junhui, Ronnie O’Sullivan and John Higgins, who all won titles in their teens. Both Trump and Selby made three centuries apiece in a high-quality final. Trump was never behind and led 3-1, 5-2, 7-5 and 8-6 before Selby pulled it back to 8-8. However, Trump, who believes he has been helped by playing regularly, held his nerve when it mattered to take the next two tense frames to collect the trophy and the £60,000 top prize. “Mark put me under a lot of pressure in the second session and I was lucky to keep the one-frame lead,” added Trump. “Then in the last frame I made one of my best clearances ever under pressure. “It was looking like being 9-9 and in the second session he came out so well. I felt good in the last frame until I got to the colours. They were all on their spots then I knew I had a chance to win. “I’ve never experienced pressure like that so to make the clearance to win my first title in my first final is pretty good. “I thought it could’ve been a big turning point at 5-2 when I missed a blue that would’ve made it 6-2 just before the break. But I just went back to the hotel and tried to get my mind off of it. “When you only had six or seven tournaments so it was impossible to get a rhythm going. It was break after break, you would play in one tournament and have two or three months off. “I’ve played in every tournament but never progressed in the final stages but this week I played really well and brought my best game. “I’m going into the World Championships with a lot of confidence which I didn’t have before. “There will be a lot of expectation on me to play well against Neil Robertson and if I don’t do that then people will start thinking that this was just a lucky week. Mark Selby was disappointed at not winning but was quick to congragulate Trump. “It was a great final and it was great to be involved,” said Selby. “All credit to Judd, he played fantastically and thoroughly deserved to win. “He played consistently well all week and put me under pressure and I played well myself – I couldn’t have done any more.